When you design an office space, you need to think a bit differently than you would when designing a home. Office spaces are utilitarian – their purpose is to allow you to work as well as you possibly can. 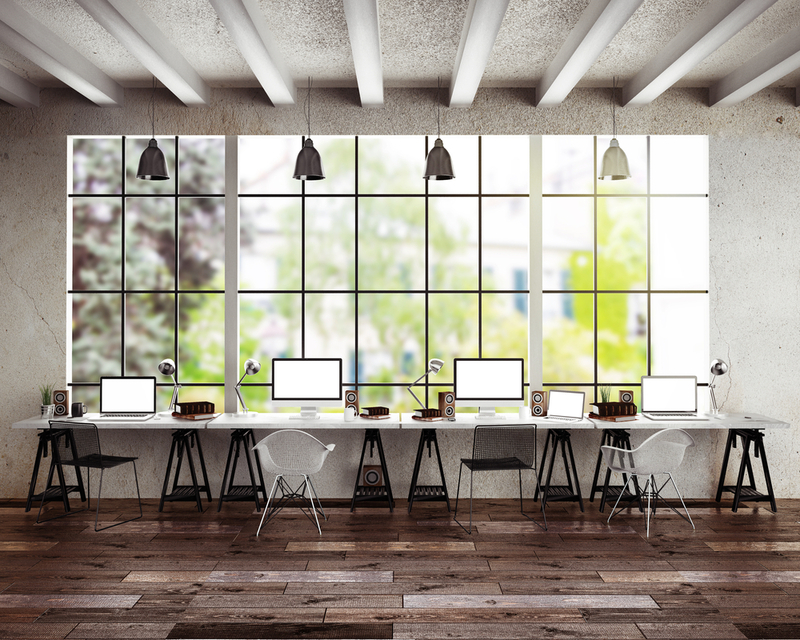 So if your office space design is linked to your productivity, what can you do to improve it? Our advice: get creative! If you think outside the square a little, you will put yourself in a good position to come up with the best office space ideas. And that means your productivity could skyrocket! To get you started, we have listed a few of our office space ideas here. Do you find yourself straining your eyes towards the end of a hard day in the office? If so, you might have a lighting problem. Lighting is one of the first office space ideas you need to rethink when designing an office. Poor lighting can be a real issue for productivity. Strained eyes can cause headaches and affect your concentration. So we recommend speaking with an interior layout specialist to come up with some effective lighting solutions. It might not seem like much, but the results will speak for themselves! You probably don’t always think of design and office productivity as being connected. But they are more connected than you might realise. And that is especially evident when it comes to colour. Colour schemes actually have quite a profound effect on productivity, and there’s a pretty simple reason why. Vibrant and bright colours encourage creative thinking – they inspire both mental and physical energy. That’s why developing a robust colour scheme is such a good office space idea! But remember, you don’t want to overdo it – excessively bright colours can be a little distracting. We recommend pairing with an expert to get the best results. Offices are some of the most utilitarian spaces in our lives. They exist for a purpose and that purpose is work. But different parts of your office serve different functions. For example, the break room in your office serves a completely different purpose to a meeting room. And we think that the layout of each room should reflect this. Your designs can set boundaries and break up your office space. By breaking up the office into sections, you can unwind more effectively when it’s appropriate – for example, during a lunch break. Then, when you return to your desk, you will be more refreshed and your workspace will be more conducive to productivity. Making the lunch room a little more relaxed with some nice casual tables and chairs, and maybe some artificial plants will help you unwind much quicker during your lunch break and make you feel as though you are not at work. Now let’s take a look at some of the most pragmatic office space ideas – specifically, storage! Storage is the key to defeating clutter in your office. Clutter is the number one impediment to workplace organisation, and poor organisation is the number one impediment to productivity. That’s why we take storage seriously; storage solutions are the only way to ensure that your office space is well organised and productive. Luckily, it’s pretty simple! Finally, it’s time to make your office a little more natural. And what better way to do that than with windows? A lot of office space ideas overlook the importance of liveability in the workplace. The simple addition of some natural sunlight or a nice view can work wonders for your comfort and morale in the office. Why not use planter boxes with artificial plants as a divider between different areas of the office to remove that ‘clinical’ feel that many offices have. By extension, natural light and greenery can drastically increase productivity. In fact, it can even help improve your mental health. Don’t underestimate the value of interior office space ideas – get in touch with the interior experts today.